The 2013 Ford Focus ST is a hot hatch around the globe but it’s even hotter in Europe and is the best-selling hatch in eight countries. Just in case you haven’t been watching, Ford is producing some of the hottest small cars on the planet. And the Europeans are snatching the fun performance cars up faster than anything else in dealer showrooms. The 2013 Ford Focus ST has become the best-selling hot hatch in Europe over the last three months of 2012. The new Focus ST is so popular in Europe that it is the best-selling hot hatch in eight countries, and Ford sold 1,984 Focus ST models from October to December 2012, or 44 per cent of all hot hatches in Europe. That puts it ahead of the popular VW Golf GTI with 33 per cent of sales. The new Ford Focus ST is getting the attention of buyers and the media. Focus ST was named “Best Hot Hatch” by U.K. magazine Auto Express and the wagon version declared “Hot Hatch of the Year” by Top Gear magazine. The third generation Focus ST in Europe went on sale last summer and is taking the continent by storm. Ford has sold a total of 3,819 new Focus STs in Europe since its launch; 74 per cent hatchbacks and 26 per cent wagons. 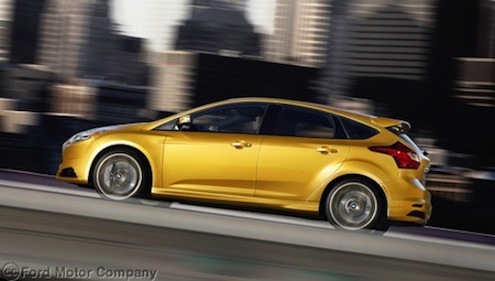 For those looking for performance the 2013 Focus ST delivers. The Focus ST is capable of 154 mph and will launch from 0-62 mph in 6.5 seconds. This is Ford’s first global performance car and comes turbocharged with a direct-injection 2.0-liter EcoBoost engine that pumps out 252-horsepower. The hot hatch also produces very good fuel-efficiency. The performance compact gets 39 mpg in Europe and delivers CO2 emissions of 169g/km. The new Focus ST is Ford’s first truly global performance car. The hot hatch launched in North America last year and is being introduced in the Asia Pacific regions this year. It features other performance features like high-performance brakes and a uniquely tuned sport suspension. Ford has completely re-engineered the Focus ST to appeal to performance car enthusiasts around the world. Ford is extending the Ford ST range with the introduction of the new 197 horsepower 2014 Fiesta ST this month, the fastest-ever production Fiesta that achieves 0-62 mph in 6.9 seconds and a top speed of 137 mph. Powered by a 1.6-liter EcoBoost engine and delivering the same “fun-to-drive” experience as the Focus, the new Fiesta ST also offers a new chassis, steering and brakes as well as enhanced Torque Vectoring Control and 3-mode Electronic Stability Control. Ford is producing some of the hottest small cars on the planet. The numbers don’t lie and tell us that buyers want performance and fuel-efficiency. The new 2013 Ford Focus ST is now the top-selling hot hatch in Europe. It’s truly a global high-performance hot hatch and is giving performance car enthusiasts around the globe an adrenaline rush like few small compacts can.